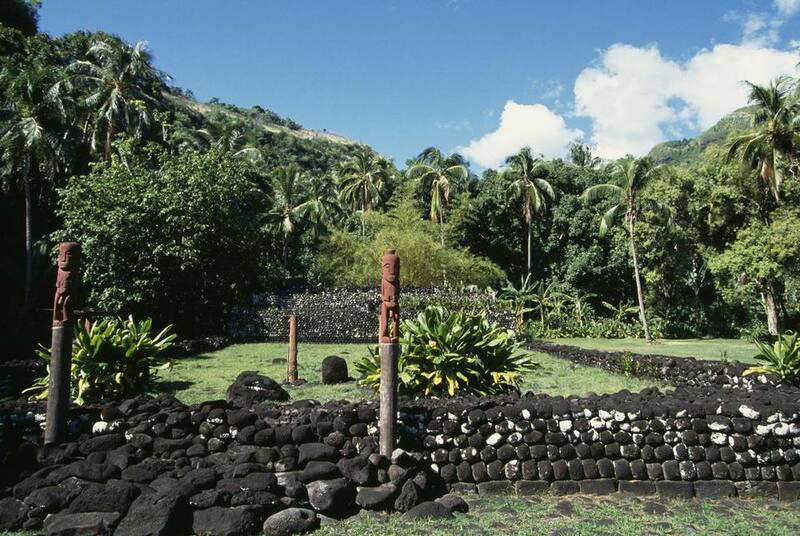 Revisit the past at these ancient Polynesian temples. Some of the most mystical locales in Tahiti are on land: the stone marae (temples) that the ancient Polynesians held sacred, and modern Tahitians still do today. While the Polynesians have always revered the sea, and for the majority of tourists today Tahiti is all about its incredibly blue lagoons, it is the land that holds the key to much of its cultural lore. The best way to understand the ancient Polynesian culture is to visit a marae, Today, most marae are just piles of stones, but before the arrival of Europeans in the 18th century, they were the center for social, political and religious activity-including human sacrifice. The ancient Polynesians were polytheists, meaning they believed in multiple gods, and they traveled to these temples to honor these gods and ask them to influence events such as the quality of their harvests or victories against enemies. Only at a marae could the gods (atua in Tahitian) be called to earth by priests (tahu'a) to embody sculpted idols and give men "mana," the divine strength responsible for health, fertility and more. Only the gods could impart mana, and so they needed to be called regularly via priest-led rituals and this could only be done at a marae. The marae rituals involved making offerings to the gods, as mana was only given in exchange for something else. Since the best gifts would entice generosity (plentiful fishing, victory in battle) from the gods, the biggest gift was that of human flesh. Human sacrifice was practiced in these specific circumstances at the marae of the district chief. The marae consisted of a rectangular yard of basalt rocks and coral slabs with an altar (ahu) of vertical stones inside. The marae was encircled by a low wall of small piled rocks, now mostly crumbling. You can find marae on all of the islands, but the most significant are the Taputapuatea marae on Raiatea, considered the most important in the Society Islands, the "cradle" of Polynesian civilization and the spot from which Polynesian navigators left to settle other islands in the South Pacific; Matairea Rahi marae on Huahine, dedicated to Tane, the principal god of the island; and the Arahurahu marae on Tahiti, which has been fully restored and is used for the reenactment of ancient ceremonies during the Heiva Nui dance celebrations in July.